Preston Prince's reputation as a technically assured, skilled and imaginative drum builder can only be further enhanced by this snare. Supremely playable. Excellent build. Deep, thick tones. This is a top-flight snare - and the price reflects that fact. Since launching Tiki drums in 2008 Preston Prince has explored all things rhythmical - making and selling high-end drums, restoring vintage kits, running drum building courses, whilst still keeping his hand in playing and teaching. On review here is a Monoply Maple snare drum from Tiki's Custom range. The 14"x61⁄2" Monoply Maple, referred to by Preston as King Tiki is clearly influenced by Slingerland's legendary Radio King snare, but it is also inspired by a Ludwig & Ludwig snare dating from 1925 that is currently part of Mike Currotto's vintage drum collection. Like the Radio King, the shell is made from a single piece of steam-bent maple 10mm thick. Preston sources his shells from a dedicated shell builder in Italy who supplies blanks that Preston then cuts to size and finishes by hand. The maple shell is deemed sufficiently strong enough to not require reinforcement rings and its long tapered scarf joint would suggest that it's unlikely to go out of true. Bearing edges are cut at 30° and completely rounded over for maximum head contact. "The wrap process alone takes Preston two days to complete"
On the outside an authentic white marine pearl wrap has been enhanced with hand painted floral inlays of gilt and ebony, with rhinestones further punctuating the strokes. This process alone takes Preston two days to complete. Ten double-ended lugs - exact copies of the original Slingerland Sound King lugs - encircle the shell. Gaskets were never used to isolate the lugs from the shell on Radio King snares and Preston sees no need to deviate from this formula, preferring the cleaner look to the shell that it provides. Preston has devised a modern update on traditional stickchopper rims by fitting hefty cast steel rims. These are undrilled so the tension rods clamp onto them with hooked claws. The Dunnett R7 throw-off is a thoroughly modern component but its lines are pleasingly retro and it fits in well. 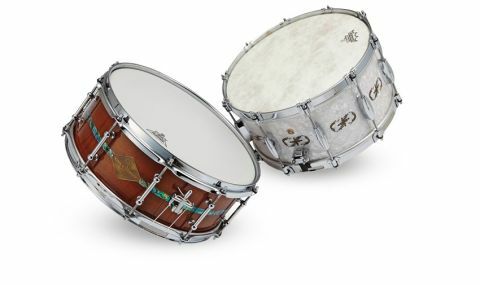 Likewise, the Canopus Vintage snare wires and Remo Fiberskyn batter head are entirely in keeping with both the snare's looks and intended sound palette. Preston is planning to make only 10 Monoply Maple snares and the lead-out time for each example is around four months. Upon first hit, the Monoply Maple responds with a gloriously thick and woody bark. The note is both bright and warm and the amount of depth on offer is cavernous. Considering how big a sound it produces it is surprisingly nimble and articulate, dealing with variations in speed and dynamics with aplomb - rimshots explode with pinging overtones while cross sticking is solid and focused.